Ronan Curtis holds his U21 award, with heavily bandaged finger. 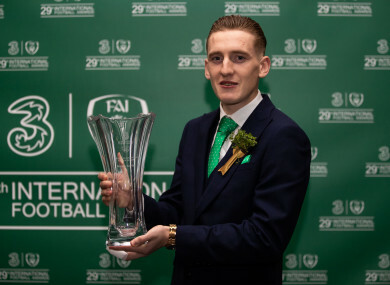 RONAN CURTIS WAS among the select few award winners at the FAI bash last night actually in a position to pick up their awards. Extra-time in the FA Cup clash between Brighton and Millwall meant that Shane Duffy and Aiden O’Brien missed out on collecting their Player and Goal of the Year awards respectively, while Leanne Kiernan and Ali Reghba weren’t around to collect their gongs, either. As for the Young Player of the Year award…let’s not go there. Curtis was able to fly over to collect his U21 Player of the Year nod, but unlike Duffy and O’Brien, the Portsmouth striker will be flying back across the Irish Sea in the next couple of days. Curtis has been forced to withdraw from the squad for the upcoming games with Gibraltar and Georgia; ruled out for at least a month having suffered a freak finger injury last week. As Curtis left his house to meet his teammates at the training ground ahead of a game with Walsall, he was stopped in his tracks by an insolent blast of wind. A warning: if you’re squeamish, maybe best to skip onto the next article. The wind was bad and as I was coming out of the house”, Curtis told The42 after the awards ceremony at RTÉ studios last night, “the wind caught the door, blew it into my finger and it came off. Yeah. It was hanging off. The nurses and specialists said that the nerves were still bleeding so it was still in good shape so they managed to attach it again, and save the finger. Eesh. Curtis is having a splint put in the finger later this week, and all going well, he will have stitches removed next week. The injury is deeply unfortunate in provenance and timing: it means that Curtis will miss the forthcoming Irish internationals – having made the winnowing of the provisional squad – along with the Checkatrade Trophy final, where Sunderland await Portsmouth in their first cup final at Wembley since the 2010 FA Cup final. “The cup final and international duty, I’m a bit gutted that I can’t go away with the lads for the week. Email “'It was literally hanging off' - Irish striker Curtis details freak finger injury”. Feedback on “'It was literally hanging off' - Irish striker Curtis details freak finger injury”.